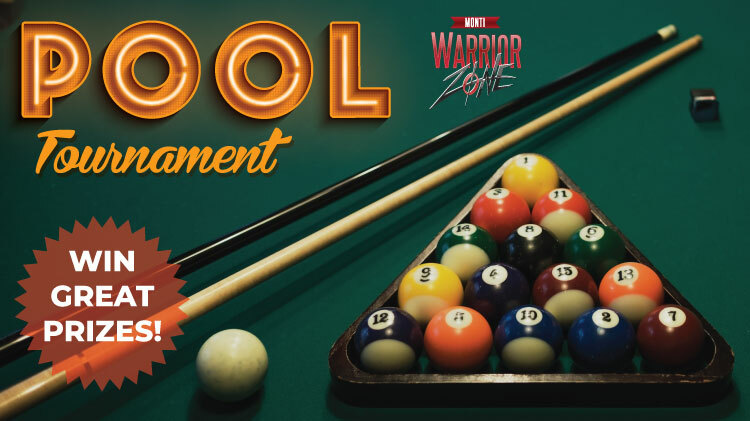 Date: Mar 7 2019, 6 p.m. - 10 p.m.
Ready to play in a pool tournament? Come to the Monti Warrior Zone to show off your skills at our next tournament! There will be prizes for 1st, 2nd, & 3rd place. Open to all patrons ages 18 and over. Registration fee is $15 and includes game and one drink. Registration is required and can be done at the Monti Warrior Zone front desk. For registration or more information call 915-741-3000.